The first volume in an important new series. The book will be of great value to railway modellers. British Railways was created in 1948 when the Great Western, the London, Midland & Scottish, the London & North Eastern and the Southern were taken into public ownership. BR inherited all their locomotives and their passenger and goods rolling stock. Whilst much has been published on BR locomotives and passenger stock, accurate and detailed coverage of the large inventory of vehicles used to convey the huge volume of goods traffic is less readily available. This new series sets out to provide that information. 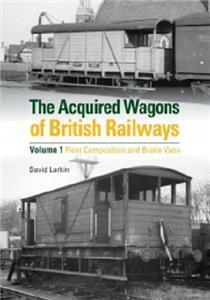 Written by one of the acknowledged experts on British railway wagons, David Larkin, this first volume sets the scene by describing in detail the wagon fleet which BR inherited in 1948 including the many private owner wagons which had been requisitioned for general service during the war. The second part of the book contains the first of the wagon directories and deals with the Brake Vans, at least one of these had to be included in the formation of every goods train running on the network. Brake vans from all the ‘Big Four’ and survivors from their constituent companies are listed and described with information provided on the entry to service and withdrawal of the various types described. Subsequent volumes that are in preparation will, company by company, provide this level of accurate and detailed information on the entire wagons fleet which BR absorbed on its formation including former private owner wagons.